Poor impulse control or deadly ideology? An overwhelming 110 members [out of 120] of the Jordanian House of Representatives signed a petition demanding a pardon for a Jordanian soldier who shot and killed seven Israeli schoolgirls in 1997. Ahmad Musa Mustafa Daqamseh shot the girls during a school fieldtrip [to the Island of Peace] in Naharayim, near the Israel-Jordan border, and is currently serving a life sentence. In 1994, Israel ceded the area to Jordan as part of the Israel-Jordan Treaty of Peace. 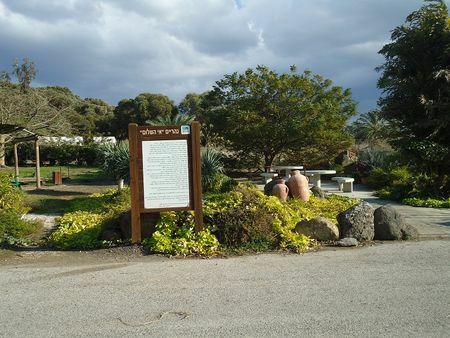 Jordan agreed to lease it back so the Israeli farmers from Kibbutz Ashdot Ya’acov could continue to cultivate the land. Farming continues under a 25-year, automatically renewable lease. A gate was established to enable Israeli tourists to visit the park without a visa or passport, on presentation of their identity cards to the Jordanian guards at the border crossing. The 1997 murders were horrific. Daqamseh said that the picnicking girls had ridiculed him while praying, so he opened fire on them from a guard tower with his M16. Then he climbed down and chased them, continuing to fire until his weapon jammed. In a gesture of a kind not seen from an Arab leader before or since, King Hussein came to Israel and visited the the shiva houses of the victims, sat on the floor with mourners, and ordered that the families be compensated. “Your pain is my pain,” he said. Daqamseh was sentenced to life in prison by a Jordanian court, which normally equates to 25 years. His defense was a form of insanity plea: he could have received the death penalty, but the court was lenient because of his “antisocial personality disorder.” And by Western standards — even by King Hussein’s — anyone who would shoot down 13 and 14-year old girls because he believed they had made fun of him would have to be crazy. I am proud of my son, and I hold my head high. My son did a heroic deed and has pleased Allah and his own conscience. My son lifts my head and the head of the entire Arab and Islamic nation. I am proud of any Muslim who does what Ahmad did. I hope that I am not saying something wrong. When my son went to prison, they asked him: ‘Ahmad, do you regret it?’ He answered: ‘I have no regrets.’ He treated everyone to coffee, honored all the other prisoners, and said: The only thing that I am angry about is the gun, which did not work properly. Otherwise I would have killed all of the passengers on the bus. Daqamseh said that Israeli girls interrupted his prayer, whistling and applauding. He said he tried to ignore the behavior of the girls, but their persistence was an insult and made him angry: “I ​​felt my blood boil, so I stopped my prayer and asked my friend to leave the area. After his departure, I started shooting,” he said. Daqamseh said that the massacre could have been avoided if adolescents had been more polite. Despite this, it was later revealed that the M-16 was jammed, which had prevented the killing of other innocent Israeli children. His ‘blood boiled’, but he also ‘did his duty’. Which is it? In 2011, Daqamseh said that he had not committed any crime, but rather “fulfilled his national and religious duty.” He was supported by Jordan’s Justice Minister (and his former attorney) Hussein Mjali, who called him a ‘hero’. There’s no doubt that Daqamseh suffered from poor impulse control. But his self-justification as ‘doing his duty’ and the statements of others calling him a ‘hero’ are troubling. I think the source of this is the concept of Muslim superiority inherent in shari’a, in which the rights of non-Muslims are strictly limited. So we find the Turkish PM furious that Muslim Turks were killed by Jews, who are not permitted to raise their hands against Muslims, even in defense. …Sister Dalal Al-Maghrabi had a conversation with the American journalist [Gail Rubin]. Before killing her, Dalal asked: “How did you enter Palestine?” [Rubin] answered: “They gave me a visa.” Dalal said: “Did you get your visa from me, or from Israel? I have the right to this land. Why didn’t you come to me?” Then Dalal opened fire on her. A non-subservient Jew — in the case of Mughrabi, just the presence of any Jew on ‘her’ land without ‘permission’ — infuriates the Islamist or Arab nationalist, and apparently justifies a violent response. And this is why the Jordanian Parliament seeks to free Ahmad Musa Mustafa Daqamseh. It is why the Turkish PM’s response to Israel’s stupid ‘apology’ was to make further demands. It is why Mahmoud Abbas places impossible conditions on a return to negotiations, and it is why Yasser Arafat rejected the Camp David and Taba proposals in 2000. It is why the Saudis and the Arab League insist that the “Arab Peace Initiative” can only be accepted as is and is not a starting point for negotiations, and — above all — it is why the PLO vehemently refuses to agree, no matter what they are offered, that Israel is the state of the Jewish people. The need for dominance is built-in to Muslim cultures. What they want is subservience, complete submission to their will, as expressed in the traditional Islamic concept of the dhimmi. And this is precisely what they will not get from today’s Jews. This entry was posted on Monday, April 15th, 2013 at 9:29 am and is filed under General. You can follow any responses to this entry through the RSS 2.0 feed. Both comments and pings are currently closed. The Imperial Japanese of the WW2 era exhibited a similar form of fanaticism. They even had “suicide bombers” – i.e., kamikazes – to die for their “cause”. But even they had the good manners to use these against warships, and not kids eating pizzas in cafes. The Nazis of that time were not far behind. Witness what it took to disabuse these societies of their notions of “superiority” and their apparent need for “dominance”. By showing restraint, we are prolonging this war. Sadly, the leaders of today – especially the Obama administration – are so utterly hollow in terms of genuine belief in what we stand for as opposed to them, that they are easily impressed and intimidated by the very fact of the commitment to their “cause” exhibited by Moslems, no matter how perverse and horrific that cause may be. Such “leaders” do not feel they have the moral authority, the courage of their covictions (they have no convictions at all, except for an adolescent attachement to a vacuous, “hipster” moral relativism) to do what is needed to defend our society. So, we’ll continue to be attacked – as we were today as of this writing in Boston – until we convince these savages what we are serious about defending ourselves. And that means using our power without restraint to punish them until they get the message that maybe, just maybe, our “G-d” is bigger than their “G-d” after all. That is what this all boils down to.